This year we have invited some friends over to do egg dyeing. Most of the kids are under the age of 3. We wanted to dye eggs but we don’t want to risk the kids burning themselves, or making a huge mess. I did a little Pinterest searching and came across this incredibly simple idea from Crafty Morning, a simple egg dye rice shaker. The idea is that you use the rice to not only add color but also texture to the hard-boiled eggs. Since the entire activity is confined to the ziploc bag the clean up is simple. It also does not need hot water or vinegar which is great for smaller children. Head on over to Crafty Morning and check out the full tutorial. We managed to use it today and we loved the results. Even the older kids thought it was a fun experience. They had fun switching the eggs to different bags in order to get a multi-colored egg. The eggs almost have a tye-dyed appearance. My oldest enjoys putting secret messages and images on her eggs by using a white crayon to draw on her hard-boiled egg before she places it in the dye. The dye covers the egg but does not cover where the crayon is. It was great fun for the whole party! Be sure to check out Crafty Morning for some other fun ideas, and head over now for the full tutorial for Rice Shaker Egg Dyeing. 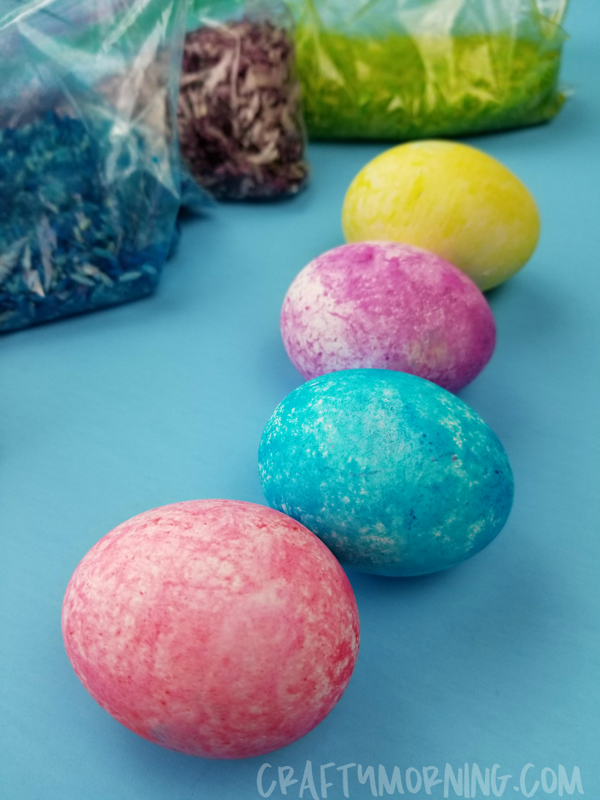 This entry was posted in Activities and tagged crafty morning, easter crafts, easter hunt, egg dyyeing, rice shaker egg dye on April 19, 2019 by Lacy. We have a lot of anxiety in our household. It sometimes causes us to be unable to participate in things, it can also cause us to rush to anger, lash out, or yell when we feel anxious or afraid. I know that my kids get their anxieties from me, I too suffer a lot of anxiety. It can be hard to understand how to make them feel better about something that I too struggle with. I try to maintain physical activity, practice self-care like alone time, and take moments to assess how I am feeling when I feel anxious about things. It is a daily struggle to try and incorporate my coping mechanisms. When it comes to my kids I try to listen, not rush, and give them a moment to find their way when they suffer anxiety. I have found ways that help them to cope with their emotions by allowing them to turn to physical activities to reduce anxiety. I recently found a great flow chart that we printed out and have used to remind ourselves how to stop and be more aware of what we are feeling and find ways to deal with it. If you have kids that you think would benefit from being more mindful of themselves and the world around them try some of these ideas at home, and if like me you cannot always remember them when you need them print the flow chart out and keep it out where you can find it in the moment. This entry was posted in Activities, Health, Learning and tagged Activities, anxiety, coping mechanisims, Health, health learning, kids, kids and parenting, kids and reading, l;earning, mindfulness, mindfulness.org, the boys store on April 16, 2019 by Lacy.